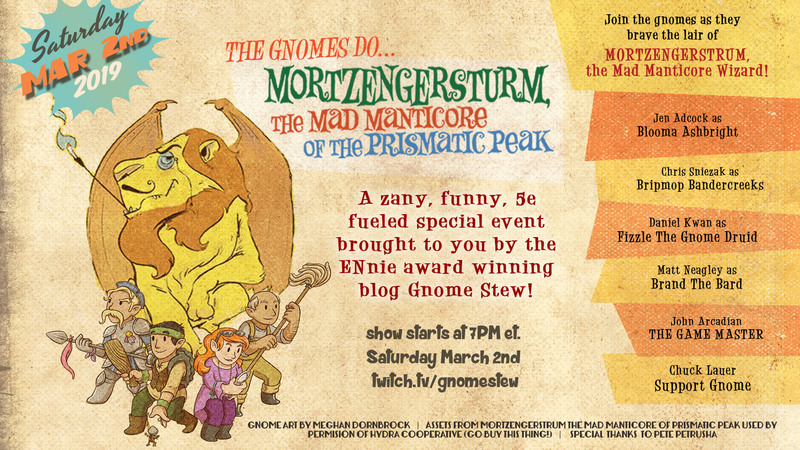 Hey Gnome Stew Fans! We’ve got some exciting news for you. Gnome Stew is making some introductory forays into Twitch streaming and video content. We’re starting with a one shot game called Mortzengersturm, the Mad Manticore of the Prismatic Peak! The game will run live on Saturday, March 2nd at 7pm eastern time and we will move it to our YouTube archive from there. Want to get a taste of it? Check out the interview we did with the creator of Mortzengersturm, The Mad Manticore of the Prismatic Peaks. So, come join us on twitch and chat with us during the stream. Follow along with Brand, Fizzle, Bripmop, and Blooma on their adventure and spread the word through Twitter, Twitch, Discord, Facebook, carrier pigeon, telegraph, turtle courier…. No Comments To "Gnome Stew on Twitch!"